Michelle is 33 and suffered her injury in a climbing accident. Michelle first heard of the Matt Hampson Foundation whilst training to take part in the Manchester 10k for another charity. A coach from Stockport Harriers suggested she approach the Foundation for support. 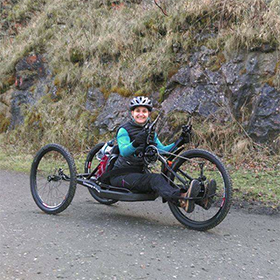 Hambo met with Michelle not long after and agreed to fully fund the purchase of an off-road handcycle to give Michelle the freedom and independence to access the outdoors again!